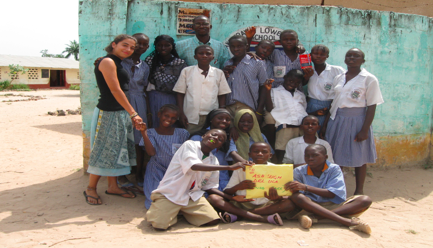 In 2008 Ashleigh Dickinson took a gap year and used her time off to teach ESL in a country in West Africa; Republic of The Gambia. She had such a profound connection with the students there that she now runs a charitable program dedicated to gathering the necessary funds to send those students to a place of higher education. This group of students started at a total of 24. The original goal was just to get the kids their high school diploma. Two years ago this goal was reached and more. An email brought news to Ashleigh of her group’s graduation from high school and that three of those students wished to keep going. Adama and Awa, who are brother and sister, and Penda are those three students. An ambition for a college education is rare in The Gambia but the ability to afford that kind of education is even rarer. The Gambia is a small country with just under 1.9 million people and approximately 4,100 square miles of land. A recent survey ranked the country the 15th poorest nation in the world. The majority of the population struggles with basic day-to-day survival and does not have time to dream of higher education. In most of the country paved roads and running water are not to be found. However, on a positive note, the people of The Gambia recently overthrew a dictatorship and the three students told the Rockland County Times their goal is to be leaders of their nation’s future. Even though he did not have electricity until he was 9-years-old, Adama has been interested in computer science since he was a young and his goal is to modernize The Gambia with more accessible Internet service that can be applicable to schools, police forces and business development. Awa wants to study business so that she can establish a hotel chain in the Gambia, which will help create jobs and tourism. Penda wants to study medicine so that she can treat people in her country and make certain medical resources more readily available. Malaria is very common in The Gambia and Penda seeks to eradicate it and other treatable diseases that have plagued the country for years. On their website Penda writes in her biography on their website about the loss of one of her classmates who fell victim to malaria. So what makes these students special is their unique and personal motivations. Their interest in education is grounded in a realistic and progressive attitude but it goes beyond a lust for intelligence. They’re passionate about helping people. They would benefit immensely from a college education in this country and furthermore, their country would benefit from it. While, what little their new government has is being offered to Adama, Awa, and Penda, Ashleigh Dickinson is following through on her mission to help the students in their latest goal; raising enough money to join the student body at St. Thomas Aquinas College. From what I’ve learned from our brief email correspondence and the photos/videos that Ashleigh provided me of these students, it’s clear that they are highly motivated, passionate, and determined to use the education our country can provide to help the people of their home country. 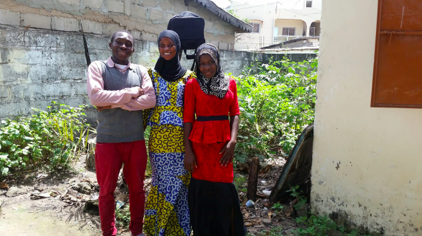 With Ashliegh’s help, Adama, Awa, and Penda are currently raising money on their GoFundMe page (https://www.gofundme.com/gmbatousa) so that they can hopefully attend college in Rockland. For more information about the Starling Sponsorship Program visit their website (https://ashleighdeluca.wixsite.com/gmbatousa).